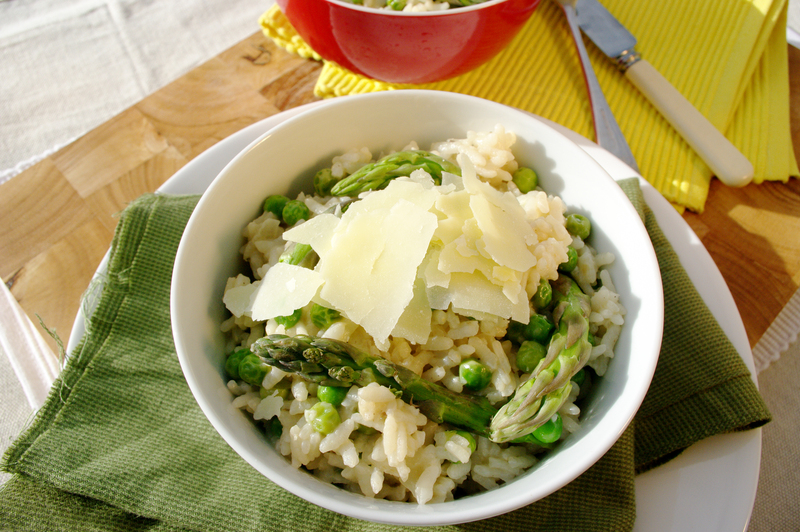 This risotto is fabulous any time of the year, you can use either frozen or fresh peas, when they are in season. It’s a simple and nourishing meal that is purely delicious comfort food and makes you feel great from the inside out. The one pot, all liquid in, absorption approach means it’s quick and easy to make, which is perfect for after a long day at work! Great as a main meal topped with some roasted cherry tomatoes and crispy prosciutto, or the perfect side to slow cooked meat. 1. Heat oil and butter in a large, deep frying pan over a medium heat. Add onion and garlic and cook, stirring for 3-5 minutes or until softened and translucent. 2. Add rice and herbs and stir to coat. Add stock and 1 cup of boiling water and bring to the boil. Reduce heat to low and allow to simmer for 12 minutes or until rice is tender. 3. Remove from heat, season with salt and pepper to taste, and add 1 cup of boiling water, McCain Peas, asparagus, lemon and 1 cup of grated parmesan. Stir well and cover for 5 minutes. 4. Remove lid, stir well and serve in bowls topped with shaved parmesan.